We’re days away from the reboot of the Nameless Dwarf series and the launch of book one: Ravine of Blood and Shadow. The entire series has been completely revised, with many cuts and a fair few additions. The net effect is a much more sharply focused story that concentrates solely on the Nameless Dwarf, whereas the original series was still bound to the Shader story arc in places. Now the path is open for the continuation of the story with book seven, King of Arnoch, which I hope to finish before the end of the year (sooner, if I get a break from the current crop of commissioned work). Please remember to sign up to my mailing list to qualify for a FREE e-copy of Ravine of Blood and Shadow (I will be sending out an email to all subscribers on launch day, offering either an Amazon gift copy or a Smashwords coupon). ARCs available to anyone who is willing to leave an honest review. Bookbloggers/tubers etc can contact me via the contact drop down menu on this website. 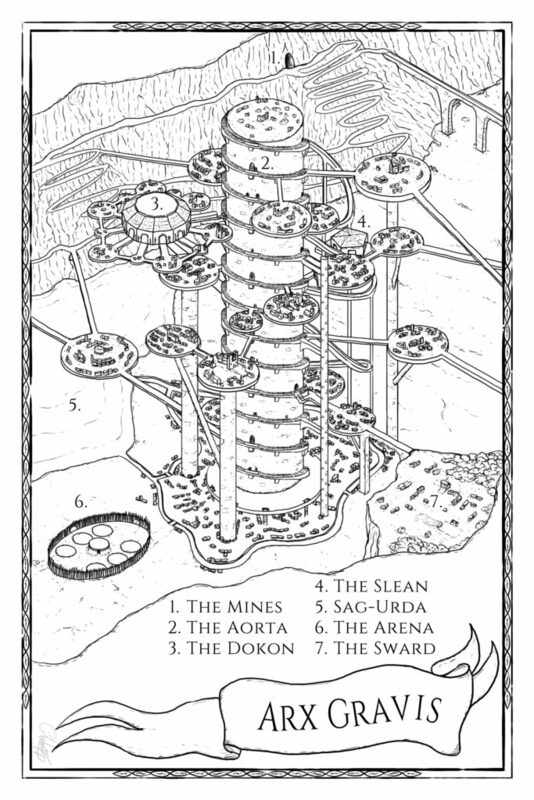 Here’s the map of the dwarven city of Arx Gravis, drawn by Greg Shipp of Lost in Maps. Please feel free to comment, and share on Social Media. As soon as I get it back from the formatter I’ll send one your way, Justin. Thanks!